Over a quarter century of industry leadership is behind today’s contact center solution supporting population health improvement. We are proud of our record of innovation to help clients address pressing challenges in a complex industry. Today’s EchoAccess solution enables improved access to care and provides meaningful tools to improve population health. 2013 commemorates HealthLine Systems’ 27th year of bringing fresh contact center solutions to healthcare with a series of industry firsts: the first integrated physician and service referral solution, the first revenue reconciliation tool, the first automated telephonic and direct mail outbound solution, the first software to offer clinical guideline protocols from world-renowned Cleveland Clinic, the first Internet-based physician-finder and class registration application, and the first fully Web-enabled contact center solution with a Web-browser user interface. HealthLine Systems’ CEO Dan Littrell commented, "We are proud of our record of innovation to help clients address pressing challenges in a complex industry. Today’s EchoAccess solution enables improved access to care and provides meaningful tools to improve population health." Reduce avoidable readmissions with outbound call queuing and documentation system for discharge follow-up calls; triage to clinically appropriate care; streamline transitions of care; provide personalized navigation; eliminate roadblocks to care with shorter appointment wait times; support one-call preregistration; reduce call processing time; document kept appointments; deploy physician-to-physician consult with one-call physician access to specialists; and protect tax-exempt status by documenting non-compensated community benefit. HealthLine software systems are offered as either cloud (hosted) or installed solutions. 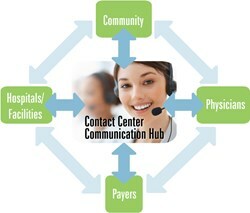 For more information about HealthLine Systems and the EchoAccess contact center solution, please visit http://www.healthlinesystems.com.